The US finds itself firmly in Old Man Winter's icy grip this year, with recent temperatures across the Midwest and Eastern seaboard rivaling those in Antarctica and, at times, even the surface of Mars. But what's behind this frigid weather? And, more importantly, when will it end? The phenomenon is known as the Polar Vortex. Earth has two, essentially year-round cyclones of ultra-cold air that circle both the Arctic and Antarctic poles counter-clockwise. "Think of this as a polar hurricane," said Al Roker on NBC. The strength of these weather systems vary throughout the year, often weakening during the summer months and strengthening during the winter. And when they get going, you'd better batten down the hatches. Stronger polar vortices result in more powerful westerly winds. These winds deposit warmer air over places like Alaska and Greenland that, in turn, push freezing arctic air further south. The winds that typically only venture far enough south to freeze Winnipeg are suddenly flowing over Fargo, dropping temperatures to 32 below zero. And while such temperatures are pretty common for places like North Dakota, the unusually wide reach of this vortex—affecting an estimated 140 million Americans in 26 states—makes it especially dangerous. In fact, the conditions for this winter's deep freeze present themselves only once every decade or two. "The big story was the wind chill factors," Jim Keeney, a meteorologist at the National Weather Center's regional headquarters in Kansas City told NBC, adding that the subzero temperatures were "something we haven't seen in 10 to 15 years." Alison Mueller skies to work through several inches of snow in Detroit. Image: Joshua Lotts/Getty Images. 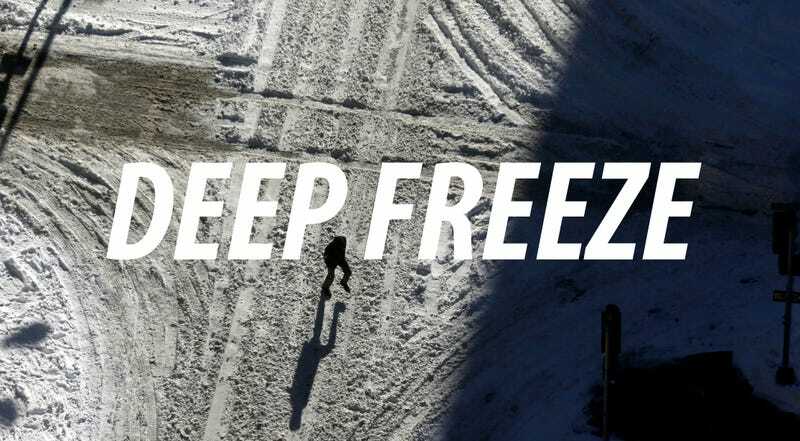 Locations throughout the Midwest and Northeast are feeling the freeze. Chicago's O'Hare airport registered -16 degrees on Monday, Minneapolis dropped to -18, or -40 with the wind chill, and Green Bay, Wisconsin dipped to just 1 degree (-17 with the wind chill) ahead of last Sunday's NFL wildcard playoff game. It is so cold that the entire state of Minnesota called in a snow day for its public schools for the first time in 17 years. Luckily, these cold snaps are typically short-lived—the northern high pressure systems eventually dissipate, allowing the polar vortex to shift northward again.